Happy Christmas and New Year from the Islamic jihad that has been raging for 1,400 years. 11 Jan 2011 - Jihad shoots Christians in Egypt, killing 1. 11 Jan 2011 - Jihad kills 13 Christians in village in Nigeria. New Year's Day - Jihad kills 21 Christians at church service in Egypt. 30 Dec 2010 - Jihad kills 14 civilians on bus in Afghanistan. 30 Dec 2010 - Jihad kills 2 Christians in attacks on their homes in Iraq. Christmas Day - Jihad kills 47 flood refugees waiting for Western food aid in Pakistan. Christmas Day - Jihad bombs Christmas Day Mass in Philippines. Christmas Eve - Jihad kills 38 Christians in attacks on church services in Nigeria. 11 Dec 2010 - Jihad attacks Christmas shoppers in Sweden. Jihad plot to bomb Christmas tree lighting in USA. Jihad plot to attack Christmas shoppers in Britain. Jihad plot to slaughter people at Danish newspaper. Jihad plot to bomb football match in Israel. And that's just for this holiday season alone! And that's not even all the attacks and plots, just the major ones! In reality, the killings roll on all year, every year, and have done for 1,400 years. And they will never end. The bombing of Christians in Alexandria, Egypt, 1 Jan 2011. 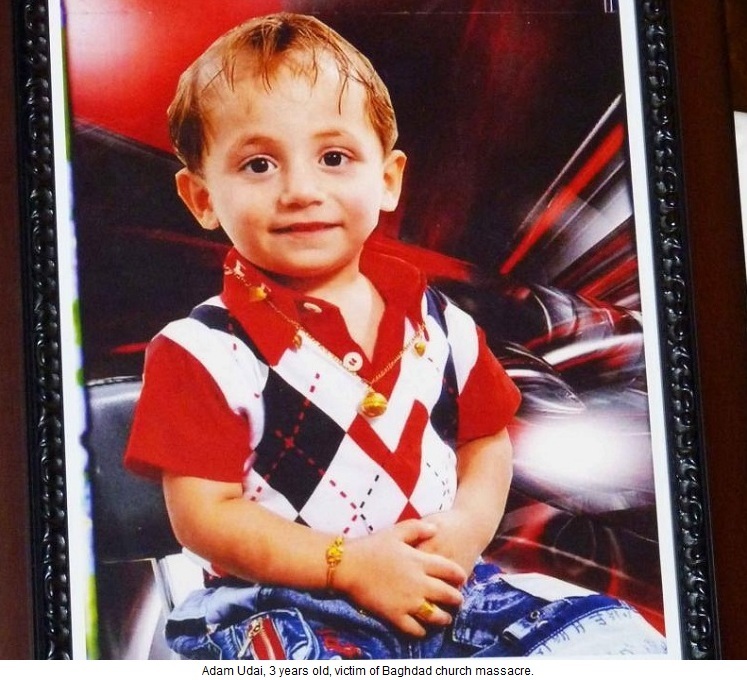 Remember Adam Udai of Baghdad, a 3 year old Christian boy who stood up to the satanic jihadis in the Baghdad church attack, Oct 2010. Adam Udai. See larger image. An American Dominican Sister wrote: "Among the victims of this senseless tragedy was a little boy named Adam. 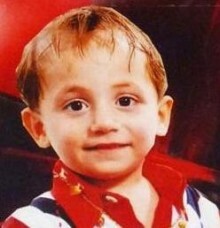 Three-year-old Adam witnessed the horror of dozens of deaths, including that of his own parents. He wandered among the corpses and the blood, following the terrorists around and admonishing them, 'enough, enough, enough.' According to witnesses, this continued for two hours until Adam was himself murdered." 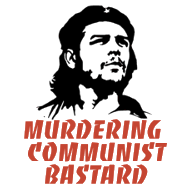 Someday Islamism, like Communism, will fall. Republicans take House of Representatives. 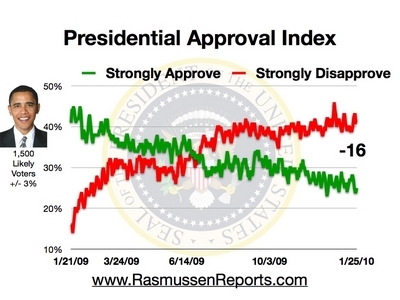 Nile Gardiner, 3 Nov 2010: "Americans say no to US decline ... The overwhelming repudiation of the Obama administration's failing policies sends a clear message to the world that the American people will not accept the decline of the world's most powerful nation." Take Your Olive Branch and Shove It, Democrats - Michelle Malkin, 3 Nov 2010, on the Democrats' ludicrous, late-in-the-day, calls for bi-partisanship after their loss. She says voters did not vote for bi-partisanship. They voted for people to stop Obama. Charles Krauthammer, 5 Nov 2010: "the massive Republican swing of 2010 was a reaction to ... a ruling party spectacularly misjudging its mandate and taking an unwilling country through a two-year experiment in hyper-liberalism. ... Tuesday was the electorate's first opportunity to render a national verdict on this manner of governance. The rejection was stunning. As a result, President Obama's agenda is dead. And not just now. No future Democratic president will try to revive it - and if he does, no Congress will follow him, in view of the carnage visited upon Democrats on Tuesday. ... As one wag put it, this wasn't an election so much as a restraining order." Good news: Allen West elected. Bad news: Keith Ellison re-elected. Funny news: Obama's old seat went to the Republicans. 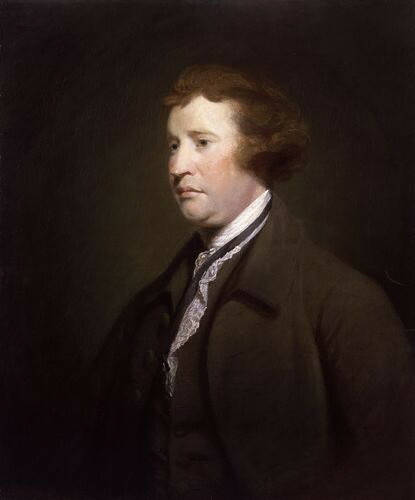 The Tea Party is the political movement of the decade, Nile Gardiner, December 31st, 2010. He notes they are very pro-British (unlike Obama). The Irish media ignorantly dismisses the Tea Party as "racist". However, 23 percent of tea partiers are non-white Anglos. Whereas 25 percent of Americans are non-white Anglos. So the Tea Party just looks like America. It is also a strange kind of "racist" movement that includes black congressmen like Allen West and Tim Scott. But they called Bush "racist" despite his black cabinet members. Glenn Beck's hilarious Gloat Fest 2010 [starts at 1:18]. The kind of stuff you can't get on Irish radio. "We Are the Ones", the Mao-like Obama worship of 2008. Next time, try worshipping someone after they have done something, not before. Mid-term elections, 2 Nov 2010. Looking forward to Obama defeat. As a non-American Westerner, I want to see a strong, assertive America that is aggressive in defending the West - the freest part of planet Earth. A weak American President is no good for America - and no good for the West either. That is why the end of the era of Obama can't come soon enough. The 2010 mid-terms are not the end, but hopefully the beginning of the end of the Obama era. It will be great fun to watch this weak, gullible, yet patronising President finally get some real opposition. Americans realise they made a foolish mistake in that exciting campaign of 2008, but they can start to put it right now. I believe in a strong America more than the US President does. I want to see a strong America. Is that such a strange thing for a non-American to want? 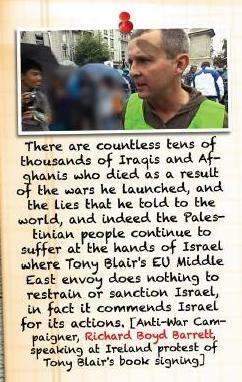 Richard Boyd Barrett quoted in Al Qaeda magazine. Richard Boyd Barrett and his jihad loving groups are demolished. Dun Laoghaire-Rathdown County Council meeting, 11 Oct 2010. "No Pressure", an environmentalist film, Oct 2010, that jokes about murdering eco-sceptics, including children. This is a genuine film. There are greens so deranged that they thought people would like this. I do not support "International Burn A Koran Day". But it should be legal in a free society. The more Islam reacts to this kind of thing with threats and violence, the more of this kind of thing there will be. giving birth to a nonsensical music video. 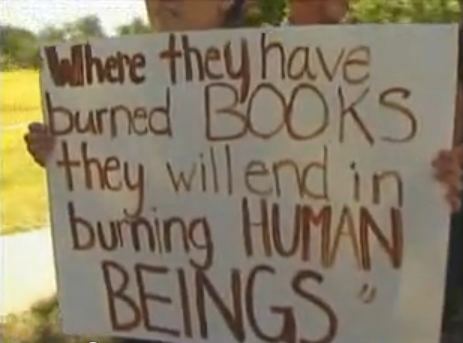 "IF YOU BURN THEIR BOOK, THEY WILL BURN HUMAN BEINGS"
"Freedom for Iraq, Palestine, Afghanistan. End the Occupation. Victory to resistance". 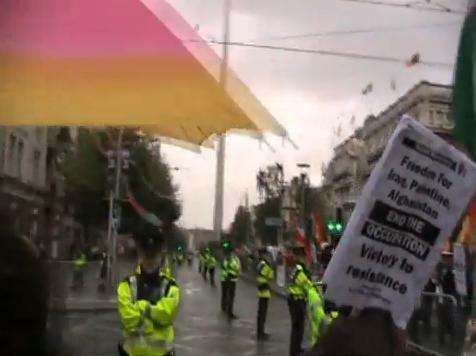 Placard in open support of the jihad resistance in Iraq, Israel and Afghanistan, carried at the Irish "Anti-War" Movement protest against Blair. 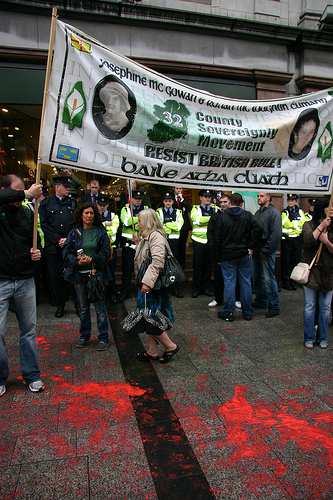 The RIRA, the people who are trying to start the Ulster war again, join the Irish "Anti-War" Movement protest against Blair. The RIRA bomb Derry, Oct 2010. You just know these men are great fathers. Somali Islamists kill 74 people watching World Cup in Uganda, 11 July 2010. Somali Islamists kill two men for watching World Cup, 12 June 2010. Taliban hang 7-year-old boy to punish family, June 2010. The first movie since 9/11 showing a fictional Islamist attack on the US. The first movie since 9/11 showing an Islamist nuclear attack. The first movie since 9/11 supporting the homeland FBI's fight against Islamism. 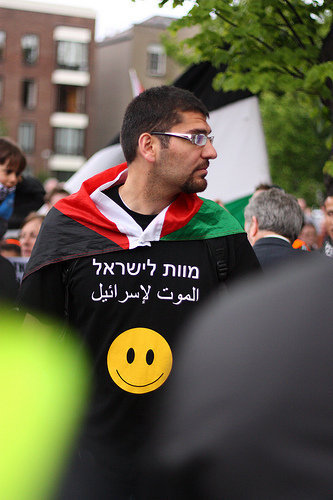 wears a t-shirt that says "Death to Israel" in Hebrew and Arabic. "We Con the World" sums it up. I love how it drives the lefties like Kos, HuffPo, Sullivan and Bock nuts. "We are peaceful travelers / we're waving our own knives ..."
The violence was all on the ship operated by the radical-Islamic Turkish IHH group. None of the other ships were violent. On the Turkish IHH ship, groups of passengers surrounded Israeli soldiers and beat them with metal poles and chairs, and threw one soldier over the side of the ship. Some passengers grabbed pistols from the IDF soldiers and opened fire. over "Everybody Draw Mohammed Day". Tories back in. Cameron becomes Prime Minister. Michael Gove in the cabinet (Education Secretary). William Hague in the cabinet (Foreign Secretary). Anti-Labour vote goes to the Tories. I could live with either party. Biggest swing to the Tories (in seats) since 1931. No swing (either in votes or seats) to the party with the most left-wing foreign policy, the Liberal Democrats. This was, though, nullified by the fact that a hung parliament means the Lib Dems will be in coalition. Alliance in NI gets their first ever MP, taking seat from DUP. Yes, I know Alliance has a leftie foreign policy and is allied with the Lib Dems. But in the NI context, they are a step forward. George Galloway loses his seat! Good riddance. Sadly, this jihad-lover came back in March 2012. Shame on the Muslim voters of Bradford West. Lembit �pik (Iranian Press TV) loses his seat. Salma Yaqoob (leader of Respect) fails to win seat. Abjol Miah (Respect) fails to win seat. BNP fails to win any seats. Lib Dems will be in coalition. Caroline Lucas (Stop the War Coalition) becomes Greens' first MP. See Caroline Lucas on Hamas. NI continues to vote DUP and SFIRA. Who would have believed 15 years ago that these two nutjob parties would now represent most of Northern Ireland? 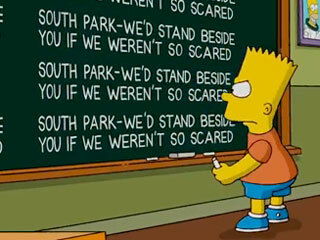 From The Simpsons episode 460, April 25, 2010. The insurgents were planning an attack. The journalists were assisting the insurgents. The van driver was probably an insurgent. After the journalists walk out of shot, a group of armed insurgents is clearly seen, armed with an AK-style rifle and RPG, clearly about to launch an attack on nearby US ground forces. It is obvious why US forces attacked this group. There is nothing illegal about this attack. One of the "Waterford 7" is charged in US in cartoonist murder plot. Another of the 7 is charged in Ireland with threats to moderate Muslim - and listed in US as unindicted co-conspirator in cartoonist murder plot. Obama is furious with Israel over some trivia, Mar 2010. Obama wants America to have no allies. Geert Wilders prosecuted by Holland for his intemperate criticism of Islam, Jan 2010. I am not a fan of Wilders. But that is beside the point. In a free society, what he says should be legal. 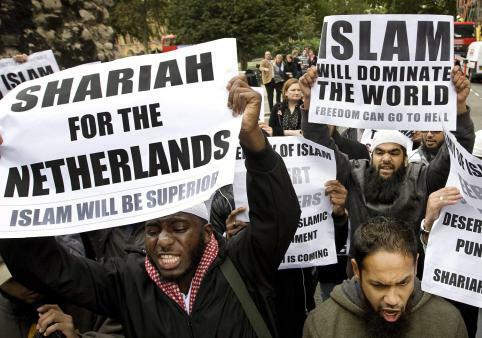 Fascists protest against Geert Wilders, Oct 2009. Fascists issue death threats to Geert Wilders, London, Oct 2009. The YouTube comments give a good idea of how Britons (including liberal Muslims) feel at these ignorant religious maniacs threatening their wonderful country, the birthplace of science and democracy. Blasphemy law introduced by idiot Fianna Fail government in Ireland. Comes into operation on 1 Jan 2010. Shame on Fianna Fail. Shame on the Greens. Shame on the PDs. Shame on Dermot Ahern. 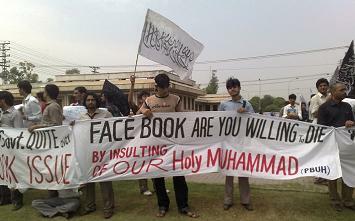 Defend the right to criticise religion. Stop Sharia law in Ireland! What is needed now is a commitment by Fine Gael and Labour that if they are elected, they will repeal the blasphemy law, and hold a referendum to delete the offensive passage from the Constitution. Poll, Dec 2009: Only 50 percent of voters say they prefer Obama to Bush. 44 percent say they would rather have Bush than Obama. Poll, Dec 2009: 41 percent of Americans are positive about the anti-Obama Tea Party movement. 35 percent are positive about the Democrats. 28 percent are positive about the Republicans. 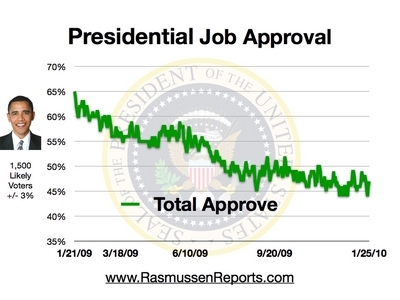 45 percent of Americans disapprove of Obama. 45 percent approve. Of those who expressed an opinion, the majority of men, whites, people over 35, income over 50k, Republicans, conservatives and independents disapprove. 30 percent think Obama is worse than Bush. 23 percent about the same. 43 percent better. 35 percent think McCain would have been better than Obama. 17 percent about the same. 37 percent worse. 35 percent think Obama makes America less safe than Bush. 38 percent about the same. 24 percent safer. Republicans win Virginia Governor, Nov 2009. Virginia voted 53-46 for Obama in 2008. Republicans win New Jersey Governor, Nov 2009. New Jersey voted strongly (57-42) for Obama in 2008. Republicans win Ted Kennedy's senate seat in Massachusetts, Jan 2010. Massachusetts voted massively (62-36) for Obama in 2008. Bush at Ground Zero, 14 Sept 2001.